Fresh Squeezed Water® Right At Your Kitchen Faucet. Our system begins where others end. The Ultra-Micron® Filtration System uses 8 stages which combine ultra-filtration with sub-micron reverse osmosis and absorption filtration to produce high-quality drinking water for your home. Water is pre-filtered to eliminate particles as small as 5 microns. Then, water passes through a 5 micron pre-filter and an activation carbon block for chlorine reduction. Using reverse osmosis, water is squeezed through a .0001 micron composite membrane that repels dissolved solids. From the storage tank, water is passed through a 1 micron pre-filter and the first of two Volatile Organic Contaminant reduction filters. The "Fresh Squeezed Water®" then passes through a second VOC filter and a taste and odor filter. 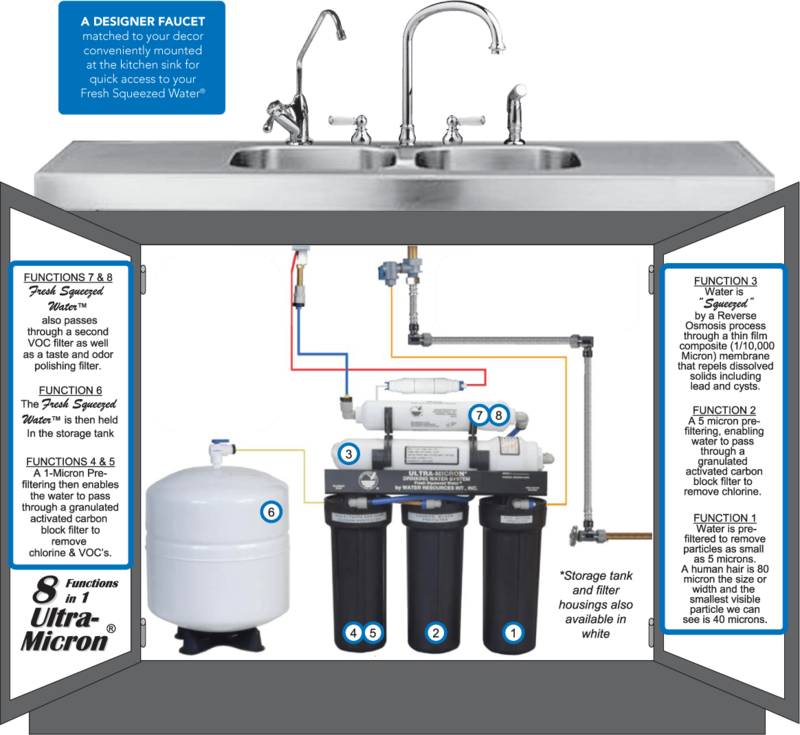 The 8 functions of the Ultra-Micron® Filtration System, combined with the 4 functions of the Hydro-Quad® Water Processor provides your family with a total of 12 functions, each designated and designed for specific filtration purposes.